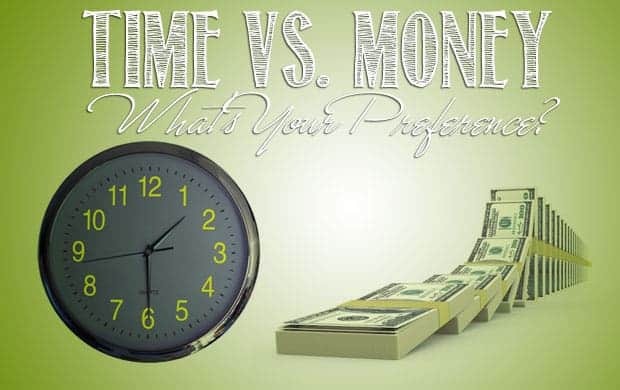 Have Money But No Time, Or Have Time But No Money: What’s Your Preference? By Melissa 8 Comments - The content of this website often contains affiliate links and I may be compensated if you buy through those links (at no cost to you!). Learn more about how we make money. Last edited July 18, 2014 . Rebecca (not her real name) has been working at the same company for 23 years, since she was 18. She started out doing factory work, and then, after she earned her accounting degree, she began working in the offices. Now, she is a high level accounting supervisor. She makes very good money, and she has a liberal amount of vacation time, but she rarely takes it because when she comes back, she feels more overwhelmed with work than when she left. She and her family are very dependent on her income. However, the job is ruining her health. Thanks to the stress from the job, she has let her health slide. She doesn't have time to exercise, and she frequently overeats because she's an emotional eater. She's now obese, suffers from insomnia, and routinely has heart palpitations. Friends and family have tried to convince her to find a different job, but she can't give up the pay because she's unwilling to change her standard of living. Instead, she tells herself that she will retire early, perhaps in her fifties. If her health holds out for another 15 years or so until she retires, Rebecca will have a very comfortable retirement financially. But what about physically? Can she recover from the damage she is doing to her body now? However, planning an early retirement is not her only option. If she were to get a different job in the same field, she would still make a comfortable living. She just wouldn't be making the six-figure income she is used to now. Why are so many of us willing to sacrifice our health for more and more money? Why aren't we willing to downscale our lives so we need less money? Would You Embrace Simplicity for a Quieter Life? 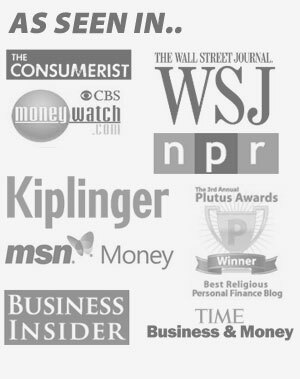 Joe Dominguez and Vicki Robin are the authors of the popular book, Your Money or Your Life. In the book, they asked people to consider whether all the work and stress is worthwhile as most people simply spend most or all of the money they make on luxuries and “stuff”. Instead, Dominguez and Robin lived a simple, frugal life that allowed them to work less for money and have more time to volunteer and do the things they enjoyed doing. Of course, embracing the principles from Your Money or Your Life doesn't mean you need to live such an austere life as Dominguez and Robin did. However, almost all of us could downsize and tighten our belt if we wanted to. Unfortunately, many people let the accumulation of “stuff” rule their lives. They buy bigger houses because they need a place to keep all of their stuff. They have garages that they can't use because the “stuff” is all in there. We have so much stuff, but we often don't have time to do what we want to do. Why are there so few of us that are willing to scale back on our possessions and luxuries so we can truly enjoy our lives? Why are we chained to jobs we hate that are ruining our health and draining our lives of joy? Is the stuff worth it? Where do you stand? Are you like Rebecca, working hard now so you'll have a nice retirement, or are you like Dominguez and Robin, scaling back now so you have more time to do what you would like? If you're not careful your work life can quietly take over. It pays to take time to bring your family back into focus. Great food for thought, Melissa. We definitely choose life and health over money. Actually, we were in the same place. I suffer from chronic migraines and job stress was making our home life really hard, because I saved all my energy to get through the next 8-hour day. We decided to live with less, so that I can be healthier and be able to provide us with a good home life. Sher–It sounds like you made the right choice. There is no price you can put on your good health! Making more money does not always translate to bad health. True, working hard may be stressful. It does not mean that people cannot incorporate exercise and healthy eating habits and take care of your health, and have good insurance. Also just because people have time does not necessary equate to working out, and eating healthy. I have been unemployed for an year, and during this time I worked out less, ate more. The converse is true, when I’m working hard mentally, I go workout and take care of my health to be more productive. Yes, I agree that life is not always about making money, its not an end goal in itself. Its not about how much you make that makes you happy, it’s about how much you enjoy what you make. It’s a tough choice for sure. I’ve been on both sides of this at one point or another in my life. I’m of the opinion now that a person should err on the side of life and family. Nobody ever looks back at the end of their life and says “I wish I’d worked more.” We definitely have to prepare for our later life but not at the cost of our present life. I think its better to live a more humble life that was overall healthier. As much as we perceive our standard of living to be essential for our well being, the truth is our health is much more valuable. You can get used to having less income, but you can’t get used to having a body that no longer works. Although its a hard decision, I would opt for the life that is healthier than the more lucrative one. This is tough because for me I can learn valuable lesson from them both. I know its cheating but I’d like to have money and make time. Why so few willing to scale back? Honestly, because for most, this is all we know, as we are under constant advertising bombardment. My husband and I moved from our 2600 sq ft home to an 850 sq ft home in order to have more money for retirement. We gave away most of our stuff, but I am still purging and it has been almost a year since the move. I think many people lose track of how much stuff they have. Really, if you have lost track, what good is it doing you except to take up space that you must pay for through mortgages, rent and taxes? After we finish paying off an investment property for retirement income, we have decided not to go back to our old way of life. We will keep it small, but maybe not this small! I want to have an extra bedroom for the grandchildren I expect to have some day and to move my desk out of the kitchen. We don’t even have a kitchen table right now because there isn’t room for both the desk and a table. It has been a pretty good experience and a good example for my sons. They see that sacrifices must be made for what is important and that stuff is not the important things in life. Previous Post: FeeX Review: Are Fees Killing Your Investment Returns?